Remember when I announced my Grab Bag Giveaway winner? Actually, I just gave you a name — Cheryl J. — but she wasn’t exactly the real winner. 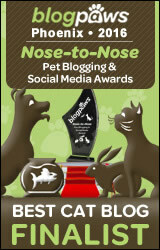 The real winners were… the cats at Forever Home Feline Ranch! You see, Cheryl is their treasurer. Recently, she sent me photos of some of the kitties enjoying the toys and I thought you would like to see them! Cheryl said, “Everyone was very excited and we had a few arguments.” Sounds like what happened at my place when my human originally opened the suitcase full of toys and treats from the Cat Writers Conference! She also said that the rescue likes to name their kitties after “our favorite bloggers and those wonderful people that support animal rescue,” and they named a kitten after me! You are not going to believe it, but it is a… tortie! Oddly enough, this is not the first time a kitty wound up with my name! I’m just happy that my grab bag of cool cat stuff went to such a deserving place! 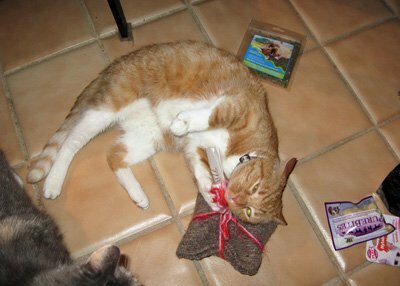 That is great that those kitties got the grab bag. Your namesake is a little cutie. That’s a pretty cute kitten, Sparkle, but I’m thinkin’ they shoulda called her Binga, MOL! 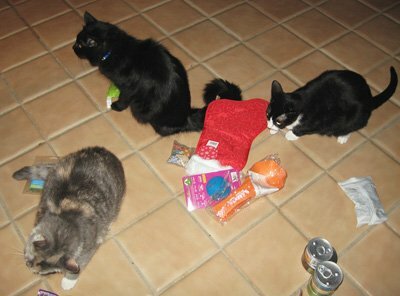 It’s so wonderful the grab bag full of fun toys went to the kitties at the Ranch! Looks like they are having lots of fun! Your namesake is very cute! It’s wonderful to see the happy recipients of your generosity! Wow! Those cats look really happy!! 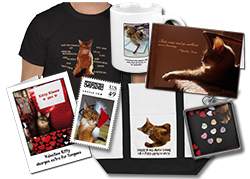 sparkle you brought so much fun and sparkle in other kitties’ life with your grab bag and your friendship. 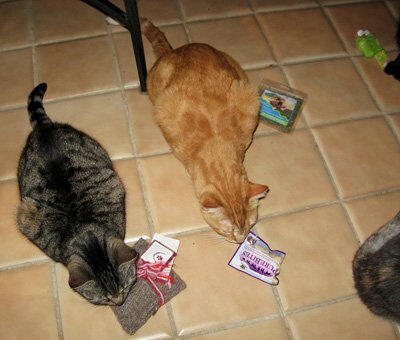 The kitties sure do love the grab bag goodies! Your name sake is a beautiful little Tortie! Well you do have a cool name and blog so I’m not surprised that kitties are named after you! We are so happy that they were the winners of the grab bag, that is so awesome, looks like they are really enjoying themselves. That is fabulous! Thank you for sharing those pictures. That is indeed heartwarming. That’s so awesome! We are very glad that they won! Hey Sparkle – what would you say that cat is in the bottom left corner of the first picture? A pastel calico? Pastel tortie? My cat looks exactly like it and I’m always wondering just what kind of cat she is! Thanks! Since she has white paws, I would say that is a dilute tortie-and-white kitty! That kitten is the cutest little thing. They picked a good one to name after you. That makes me so happy!!! xoxoox to you. That’s wonderful, Sparkle! 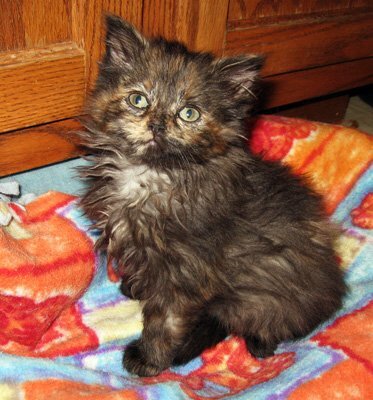 And Baby Tortie Sparkle is pretty cute! How cool that homeless kitties got a prize! Congrats on the namesake, she’s sooo cute!! OH! I would LOVE to adopt her! She reminds me of my Lucy, who is now in heaven. What a great place for your grab bag to goes! And the kitten that gots your name is a real cutie! Sparkle, that was SO kind of you! And the pics look great! They all look like they’re having a ball! That is so cool how much they appreciated everything. I think it’s amusing she named a tortie after you. Blinga would’ve been a better name for a tortie. That is so wonderful, and that mini-Sparkle is way too cute! Your namesake looks like a total sweetie pie and a budding beauty – you are right to feel flattered. (Callie’s Mommie here) Every year I try to put together a care package of toys and treat to give to the local Humane Society. I could try to be all noble and say that I do this for the poor kitties without a home and that is a part of it. But I must also say I do it because giving out this package makes me feel better than any gift under the tree does. WOW! That is some win there! We’d be fighting over that stuff here too. Aw, heck, my two are always fighting. Ugh. Congratulations to the winner. What a bunch of good stuff in the grab bag too. Very cool! How nice those guys got those toys! What lovely pictures, it looks like they are having so much fun!!! Btw how did you get your name Sparkle? Wow – we are glad the give away is going to the homeless kitties!!! And that tortie baby is pretty darned adorable!!! What a lovely, heartwarming story. Sparkle is so sweet, hope she goes to a good home. That is so great that the grab bag ended up at a shelter. OMG, your namesake, Sparkle is just too cute. That one should find a home really soon. We are so glad you gave away that grab bag stuff. Take care. Happy Tuesday. How lovely to see those kitties enjoying their toys – your namesake is very pretty Sparkle. Aw, those kitties look so happy! And cool beans on the name sake! What a pretty kitten!